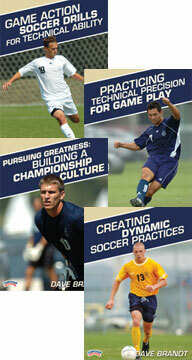 By buying this bundle of DVDs, you will have almost everything you need to build a great soccer program. This DVD package covers how to build culture of excellence, provides step-by-step instruction for creating engaging practices, and gives instruction on both the technical and tactical elements of the game. If a high school or club coach effectively teaches the content in these DVDs, they will take their team to the next level of competitiveness. Just like any reputable book store or retail business, we have a 100% money back guarantee too. If for any reason, your purchase is not what you expected, just send us a message and we’ll give you a full refund. Be the first to review “Dave Brandt 4-Pack of Soccer DVDs” Click here to cancel reply.